Whether you have one or two balls of yarn for your current project or you’ve achieved SABLE (stash acquisition beyond life expectancy), organizing your yarn stash can be the difference between enjoying the yarn in your collection and being overwhelmed by it. But organizing doesn’t have to be difficult. Let’s start with a few basic steps and learn how to spring clean your yarn stash. How much yarn do you have, anyway? Before you organize your stash, take a long weekend to catalog your collection (yes, even those bags of yarn in the closet). If that’s too overwhelming, spend an hour each day looking for yarn until you know what’s on hand. 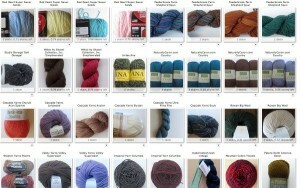 I find it helpful to photograph my yarn and post it in my Ravelry yarn stash. Keep it on display or out of sight? Once you know how much yarn you have, choose your favorite storage approach. Do you want to hide your stash, or do you prefer to have it on display? For hidden storage, plastic bins are a great option since they can be stored in a basement or closet. Airtight storage can even help keep out moths. 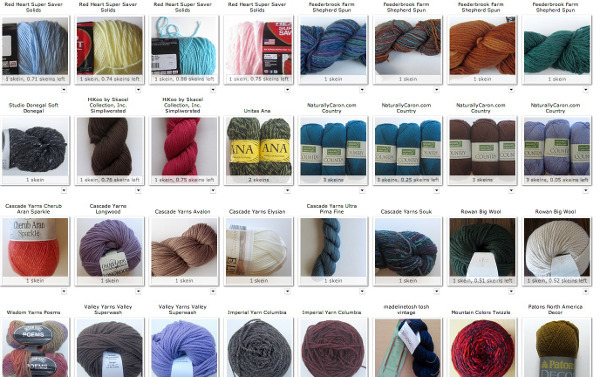 A disadvantage to hidden storage is that you may forget what you already own, so posting your stash to Ravelry will give you a quick visual reminder of what’s in your stash. If you’d like your yarn collection front and center, consider dedicating a bookcase to your stash. You can stack yarn up on the shelves, just as you might see in a local yarn shop, and your crochet books can help to prop up yarn. This approach requires more maintenance, as you’ll need to protect your yarn from dust, pet hair and critters, but it allows your collection to shine. Perhaps you want to take a more balanced approach with storage baskets. Fabric or woven storage baskets are now available in a variety of sizes, colors and shapes, and they can be stacked in bookshelves or left on a table for display. A behind-the-door shoe organizer stuffed with yarn can allow flashes of color from your yarn collection to peek into your room. Keep an open mind during visits to thrift stores and antique shops; a large ceramic or glass bowl makes a great yarn centerpiece. A vintage storage chest can also be a great storage container – but be sure to clean it thoroughly so you don’t introduce any yarn-eating bugs into your home. Once you’ve picked the right storage approach for you, decide on the best way to organize the yarn. The four major methods are by color, by fiber, by yarn weight and by project type. The best approach for you will depend on a combination of the type of yarn in your collection, your storage approach and the type of crocheter you are. Organizing by color looks wonderful if your storage approach includes some open or clear containers. You may even choose to store different colors in different rooms, based on your décor. Organizing by fiber, yarn weight and/or project type makes it easier to “shop your stash” before starting a new project. 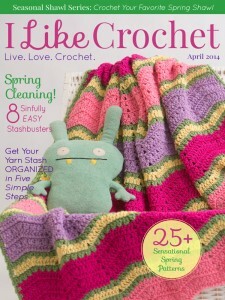 You may also use a combination of these approaches based on your personal crocheting habits. Planning ahead before organizing your stash, by cataloging your yarn on Ravelry and choosing a storage approach and organizing system, will help you keep your yarn orderly for years to come.